Transportation produces roughly one-third of our CO2 emissions. And as we are not going to stop travelling or getting products from other parts of the world (for the moment), one reasonable way to reduce our emissions is to change our vehicles, optimize them, or both at the same time. In this sense, hybrid cars leaded by my beloved Prius were a good first step that is getting some success in the last years, at least in my home city, Bilbao. However electric cars seemed to be further from real world use, competing with the weakening hydrogen cars. I mentioned a nice project some time ago, but it was just that, a nice project. In this context I got very positively surprised to see that the company that makes succesful F1 engines is able to sell a small but cheap electric real car in normal car market. It is called Twizy and I know a real user close to me (the photo is taken thanks to that). His main complain is about the charging time of the batteries, yea this problem is not solved, and the low vehicle range neither but it is a first step, and all the great developments were done in far from perfect real steps. 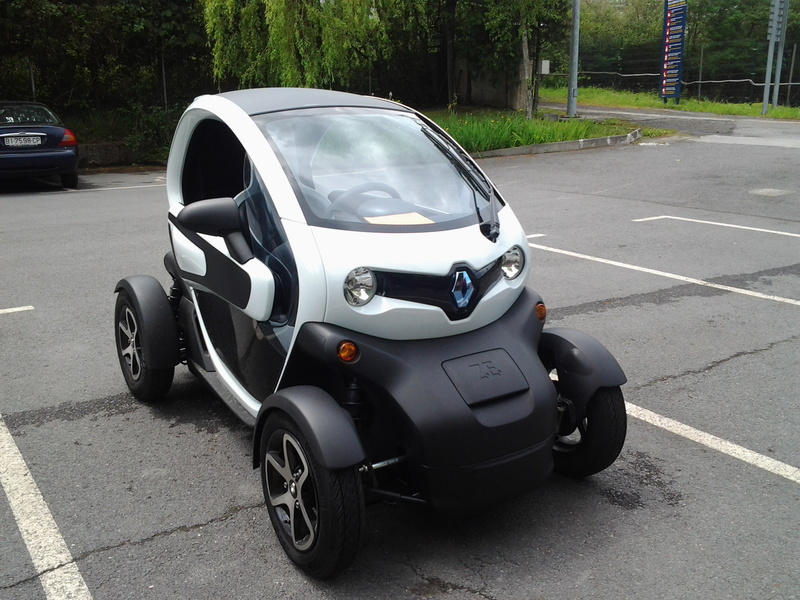 One nice solution from Renault for the price reduction is to hire the batteries, it is a kind of loan from the company, payable with the low fuel expenses. My main criticism about this car is that is not really a car, it has not windows, it is more of a hybrid between car and motorcycle and only admits one passenger. OK, but it is a first step, an electrical vehicle in the streets that gets energy from standard plugs. One last thought, some complain about the risks of its lack of noise. How used are we to the problems of combustion engines! I hop we will have to adapt. This Saturday, with the hope of the beginning of Spring in Northen Hemisphere an interesting event will take place: the earth hour. I think I remember it or something similar from other years, but in any case I got the news from a street advertisement (classical media are still useful to some extent, although it would be great to get it from Angry Birds). In their web explain it started in Australia in 2007, it is widespread now throughout the world, it is organized by WWF and wants us to make a contribution against climate change. The actions consists of turning of lights for one our from 20:30 to 21:30 on Saturday. I understand that it is local time, so it will not be simultaneous for all. I suposse that a coordination of a simoultaneous one is much more difficult but it would really funny for any astronaute or an alien observer. Now, that were are in strike and demonstration times in Europe this other way to revindicate things its quite refreshing for me. New times, global problems and posibilities require global actions and new ways for cityzens in any part of the world. I think it has many unexplored possiblilities not only for general reivindication but also for more concrete ones. For example, recently there was a crowded demonstration asking to shut down Garoña nuclear power station, most people living close to it, particularly in Basque Country is quite worried by this old nuclear very similar to Fukushima. Demostrations are OK, but maybe a massive reduction of power requirement and commercialization might be more worrisome to the owners of the power station or the Goverment making the decision. I believe in the joined power of small citizens, it is something we need in climate change, we need a big and diversified driving force. Making concrete things is a way to start and feel you get some reward. It is just a symbol, but it could help to gain moment. Next saturday I will try to shut down the lights and if we are lucky and more people shuts down their lights and the clouds go to another place enojy one hour of starry night in the city. I will prepare the telescope.